If you are the person responsible for supplying the office with Dunkin' Donuts products, prepare to have your mind blown. Dunkin' Donuts new "Dunkin' Run" iPhone app is going to change your life forever. Dunkin' Run brings customers a completely new and unique social online group ordering experience and tools. 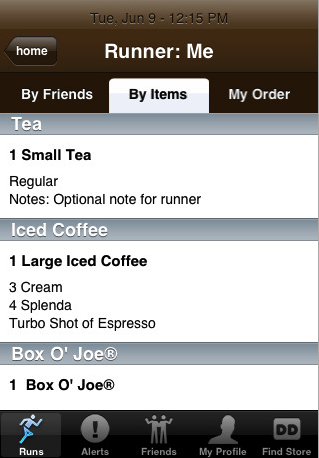 To begin, "Runners" can initiate a group order on www.DunkinRun.com through their computer or mobile device, or via an iPhone application available for free download at the iTunes online store. Immediately, interactive alerts are sent to the Runner's list of friends or co-workers, telling them when a trip to Dunkin' Donuts is planned along with a personal message inviting them to place an order online. Invitees can view the Dunkin' Donuts menu to place their order, and registered users can select from their own personal list of favorites and/or previous orders. All Dunkin' Donuts core foods and beverages are presented using interactive product images to make personalizing an order both simple and fun. All of the orders are integrated onto a single page/screen which the Runner either prints or uses their iPhone or mobile device to bring to any Dunkin' Donuts store. Dunkin' Donuts crew members will use this checklist to fulfill orders quickly and ensure order accuracy. The Runner can also use this page as a checklist to ensure that everyone in the group gets what he or she ordered. CANTON, MA (June 22, 2009) — America still runs on Dunkin', but today everything changes for anyone responsible for getting Dunkin' Donuts coffee and baked goods to keep friends or colleagues running. Dunkin' Donuts, America's all-day, everyday stop for coffee and baked goods, today unveiled "Dunkin' Run(tm)," an innovative interactive web site and iPhone application that will enable customers to solicit and place Dunkin' Donuts group orders in just a few clicks with unprecedented ease, speed, accuracy and fun. According to Dunkin' Donuts' Brand Marketing Officer, Frances Allen, Dunkin' Run is a powerful example of the company's commitment to bring value to people in new and innovative ways. "People love Dunkin' Donuts because more than any other brand, we're all about offering high-quality, easy-to-order products and getting our customers on their way and back into their busy lives as quickly as possible," she said. "Dunkin' Run extends that same spirit and commitment to the office, the dorm or any group, leveraging fun and exciting online and mobile tools to make it even faster and easier to keep yourself and others running with a great cup of coffee or a breakfast sandwich any time of day." Dunkin' Run was a joint collaboration between Dunkin' Donuts and its advertising and digital agencies of record, Hill Holliday and Studiocom, respectively. "We conceived of Dunkin' Run as a social application that helps hard-working Americans stay slightly more productive," said Baba Shetty, Hill Holliday's Chief Media Officer. "It's based on the idea of reciprocity - I'll get your coffee today and hopefully you'll get mine tomorrow - in a way that perfectly complements the 'we're in it together' ethos of the Dunkin' Donuts brand." "Dunkin' Donuts has always been an innovator, so developing new ways to socially engage with consumers via the mobile web and the iPhone application is an extension of that tradition," said Thomas Spicer, Managing Director of Studiocom. "We created a platform that simplifies and expands upon existing consumer behaviors, making it easier and more convenient for groups to interact and order, whether they are at home, work or on the go."